Rapid development and fast-tracked approvals of immune-checkpoint inhibitors have led to the first registration in non-small cell lung cancer (NSCLC) in 2015. Just over two years later, immunotherapies start to dominate the frontline treatment of NSCLC. This expansion of therapeutic options will soon reflect in dramatic changes to the treatment guidelines, where immunotherapies are expected to complement the chemotherapeutic options. 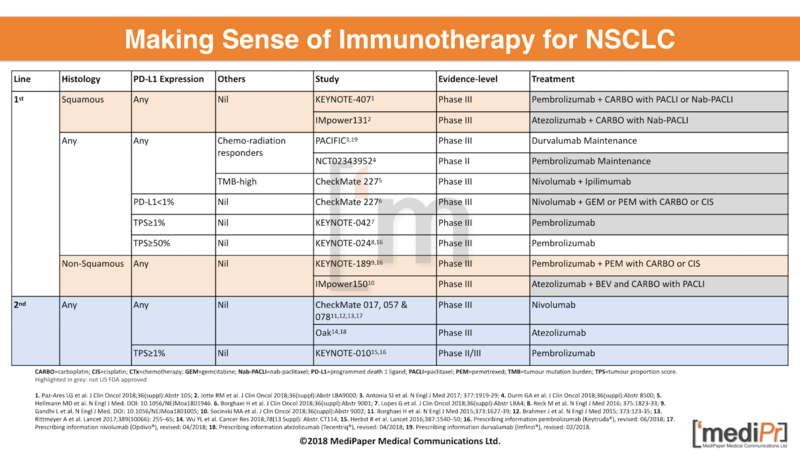 A brief communication of the relevant immuno-oncology data in NSCLC. In the open-label Phase II KEYNOTE-021 study, the addition of pembrolizumab to carboplatin and pemetrexed in patients with non-squamous NSCLC (N=123) improved the overall response rate (ORR) to 55% from 29% with the doublet alone (P=0.0032). An improvement regardless of PD-L1 expression. The median progression-free survival (PFS) was 13.0 months with the addition of pembrolizumab vs 8.9 months for the pemetrexed/carboplatin doublet (HR=0.53, P=0.0205, 95% CI, 0.31-0.91). Patients in the pembrolizumab arm continued to receive the immunotherapy up to 24 months. After a median 10.6 months follow-up, 88% of patients in the experimental-arm remained alive and progression-free compared to 78% of patients receiving the doublet. The multi-centre, double-blind, Phase III KEYNOTE-189 trial confirmed the early results of the KEYNOTE-021 study. In the KEYNOTE-189 study, 616 EGFR– or ALK-negative non-squamous NSCLC patients were randomised 2:1 to receive frontline pembrolizumab or placebo in combination with pemetrexed and a platinum salt. The co-primary endpoints of improved overall survival (OS) and PFS were met and published in the New England Journal of Medicine in April 2018. At a median follow-up of 25.2 months in the open-label KEYNOTE-024 study, pembrolizumab more than doubled median OS compared to platinum-based chemotherapy in 154 NSCLC patients with a PD-L1 expression ≥50% and negative EGFR- or ALK-status. Single-agent pembrolizumab led to a 30.2 months OS vs 14.2 months with chemotherapy (HR=0.63, P=0.002; 95% CI, 0.47-0.86) despite the crossover of 82 patients from the chemotherapy-arm to the pembrolizumab-arm. The 24-month OS-rate favoured pembrolizumab vs platinum doublet: 51.5% vs 34.5% respectively and the ORR was 45.5% in the pembrolizumab-arm compared to 29.8% in the chemotherapy-arm. The phase III PACIFIC trial (N=709) randomised patients 2:1 to either receive durvalumab or placebo after chemoradiotherapy. Durvalumab-maintenance therapy was associated with improved median PFS, 16.8 months in the durvalumab-group vs 5.6 months in the placebo group (HR=0.52, P<0.0001; 95% CI, 0.42-0.65). The 12-month and 18-month PFS-rates both favoured the immunotherapy: 55.9% (durvalumab) vs 35.3% (placebo) and 44.2% (durvalumab) vs 27.0% (placebo) respectively, and was irrespective of PD-L1 expression before chemoradiotherapy. Durvalumab treatment was associated with a higher ORR of 28.4% vs 16.0% with placebo. Patients with a response to the immune-checkpoint inhibitor had durable, ongoing responses of 72.8% at both 12 and 18 months. In the placebo-arm, the 12- and 18-month ORRs were 56.1% and 46.8%, respectively. 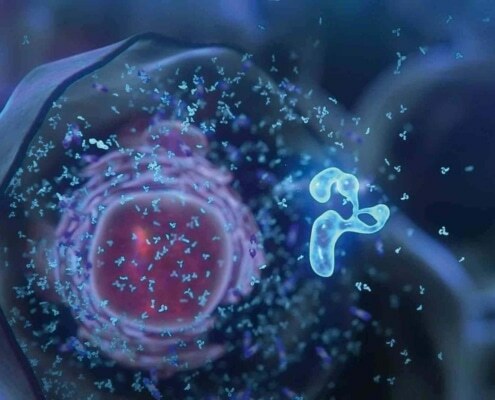 Preliminary results of the Phase III CheckMate 227 show that the combination of nivolumab and ipilimumab improves PFS when compared with chemotherapy in treatment-naïve patients with high mutation burden (high-TMB) NSCLC. The co-primary PFS endpoints was met and published in the New England Journal of Medicine in April 2018. Common nivolumab and ipilimumab-related side effects. In the multicenter, open-label Phase II IMpower131, the addition of atezolizumab to 4 or 6 cycles of carboplatin and nab-paclitaxel in the 1st-line delayed progression or death compared with chemotherapy alone in patients with advanced squamous non–small cell lung cancer (NSCLC). The co-primary endpoints were PFS and overall survival OS and the latter was not improved. The results have not yet been published. The Phase III IMpower150 trial previously showed that the addition of atezolizumab to bevacizumab, carboplatin, and paclitaxel delayed progression or death by 38% in patients with advanced non-squamous NSCLC. The median PFS improved to 8.3 months compared with 6.8 months for bevacizumab and chemotherapy alone (HR=0.62, P<0.0001; 95% CI=0.52-0.74). The 12-month PFS-rate was 37% after addition of atezolizumab vs 18% for bevacizumab plus chemotherapy alone. The preliminary OS improved to 19.2 months vs 14.4 months respectively (HR=0.775, P=0.0262; 95% CI=0.619-0.970).